Creating spring application in myeclipse IDE is simple. You don't need to be worried about the jar files required for spring application because myeclipse IDE takes care of it. 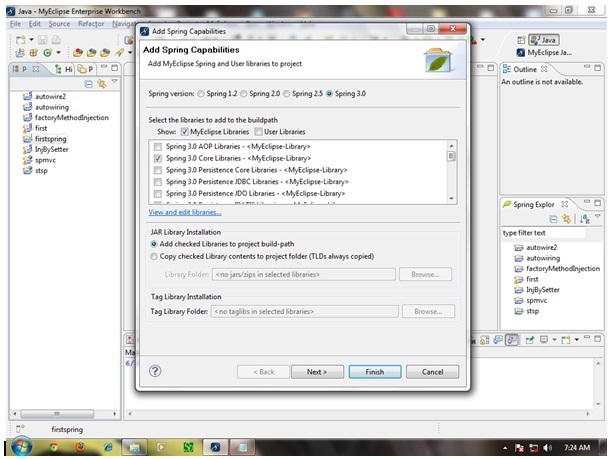 Let's see the simple steps to create the spring application in myeclipse IDE. Let's see the 5 steps to create the first spring application using myeclipse IDE. Go to File menu - New - project - Java Project. Write the project name e.g. firstspring - Finish. Now the java project is created. Go to Myeclipse menu - Project Capabilities - Add spring capabilities - Finish. Now the spring jar files will be added. For the simple application we need only core library i.e. selected by default.